For the last three years, the dairy market conversation has been dominated by global milk supply growth and European intervention stocks of milk powder. These twin factors put us in a buyers’ market and kept a lid on global prices. 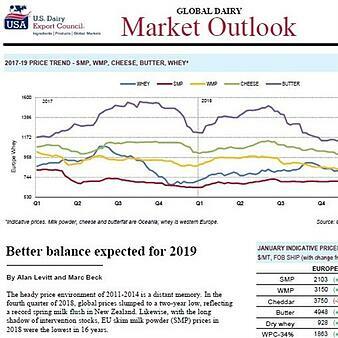 But we start this year under different circumstances, as we explain in USDEC’s latest issue of Global Dairy Market Outlook, a publication that assesses the state of global dairy trade, loaded with data and analysis. For the first time since the fourth quarter of 2016, most major suppliers won’t have much excess to export. And for the first time since early 2016, traders are operating in an environment without the overhang of intervention stocks. As the world’s largest exporter, EU milk production always has an outsized impact. Weather has depressed production in Germany and France (-2.1 percent in October-November) and phosphate regulations have done the same in the Netherlands (-5.7 percent in September-December). Gains in Ireland and Poland haven’t been enough to compensate. EU-28 deliveries were down about 0.5 percent in the last five months of 2018. We look for output down 1.0 percent to 1.5 percent in the first quarter of the year and expect to see little to no growth for the full year. The United States, Australia, Argentina and Uruguay also are seeing contraction in milk production growth. Meanwhile, the European Commission unloaded 247,857 tons of SMP out of intervention in the last four months, a third of that in a single mid-January tender. Holdings are down to just 3,651 tons and the cupboard should be empty after this week’s tender. As a result of this shift, commodity prices improved in December and early January. The rally is certainly welcome, but there are still headwinds that could limit further price gains during the first half of the year. New Zealand is enjoying a record milk production season in 2018/19. Pipeline holdings were rebuilt when prices were lower, which allows buyers to be less aggressive as prices improve. SMP from intervention hasn’t all been consumed yet; it’s merely been moved further along the supply chain. The North Hemisphere spring flush will start to build in the coming weeks. When we get past the flush we could see further tightening, particularly if global demand remains good. Improved demand from China, Southeast Asia, North Africa and Mexico helped clear global supply in the latter part of 2018. To read U.S. 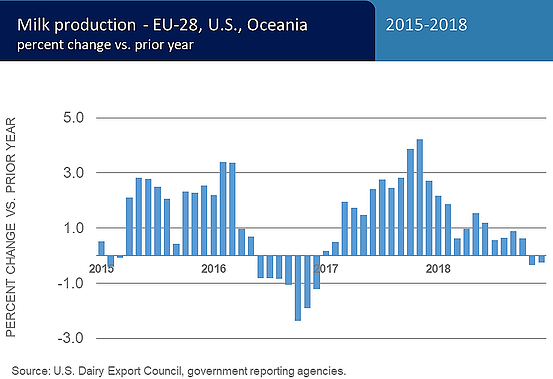 Dairy Export Council’s full outlook on dairy market drivers and U.S. performance, download the latest Global Dairy Market Outlook. Al Levitt is vice president of communications and market analysis and Marc Beck is executive vice president and business unit director, Middle East/North Africa, at the U.S. Dairy Export Council.